South Grand Lake Chamber of Commerce is making plans in conjunction with Cherokee Casino to host the upcoming Bootleggers Ball. The event is scheduled for April 13th, from 6 pm to 9 pm at Cherokee Yacht Club. Tickets are available for $20 each and includes $1,000 in funny money to spend at the live table games. There will also be a live auction, awards for best dressed, a buffet available for $25, and is open to the public. There is an annual gathering that happens in the town of Disney, OK, and is the largest attended event of the year for the surrounding area and maybe even one of largest of the state of Oklahoma. It's called Big Meat Run (BMR). It started 17 years ago by a man named John Sumner. John operates his own machine business called Sumner Machine Works in Arkansas City, OK, and he started BMR as a customer appreciation event with only 12 participants the first year. Little did he know it would eventually create such an incredible following of adrenaline junkies and spectators to the tune of approximately 14,000 people. If you have the opportunity to make it to South Grand Lake you should check out the list of events and make plans to attend. The sun is shining!!! The temperature is in the 60's and it feels amazing!!! We've seen several boat sales over the past few weeks and so many Grand Lake Boaters in and out of the marina during St. Patrick's Day weekend. It also happens to be the start of Spring Break week in multiple schools all over the state, which would also means that Spring is FINALLY here!!! I really don't feel that we will see below freezing numbers again this season so if your boat is still winterized now might be the time to start preparing the checklist for that maiden voyage of the year. If you need assistance on the summarizing process, please give our service department a call and get it scheduled. We made it! We finally made it to Daylight Savings Time and the hour we will loose will be so worth it to have daylight hours extended in the evening. When you live on the lake there are so many opportunities to stay busy outside. The extra daylight hours give us all the ability to escape the feeling of cabin fever and to enjoy the extra fresh air and fun. Don't forget to set the clock up one hour. Yes, you lose an hour of sleep, but you gain countless hours and days to make memories outside in the natural light. We had a fantastic turnout for the poker run during Welcome Back Weekend. The traffic through the ship store continued throughout the day by land and by grand. It was awesome to see so many of you dressed up and enjoying the festivities, even though the weather was a bit chilly and on Sunday we woke up to snow and a frigid single digit number that kept most of us inside on the couch and beside the fire. My ever-positive side continues to keep me looking forward to Spring!! Let's all keep the passion going and continue to stay positive. Get those water toys ready - Spring really is coming!! It's time once again to welcome everyone back for the most amazing time of year. If you're a lake person then this means EVERYTHING to you. Myself and so many of my friends are "that" lake person! On Grand Lake, some of us can still boat all year but one thing we can't do all year is eat VIP Pizza! FINALLY, today we were able to get away from the office and enjoy the most amazing pizza on Grand Lake! If you haven't ever had the opportunity to try it, then make your way over to Ketchum Cove by land or by lake! You will not be disappointed!! Make plans to be with us in two weeks as we kick off the festivities for Welcome Back Weekend. It seems like it has been too long since we last saw the waning days of summer 2018. As we patiently wait for the arrival of Spring 2019, we can't help but remember just a few weeks ago that Punxsutawney Phil didn't see his shadow and the promise that we might have an early spring. With that thought in mind, we can look at the past few weeks of bitter temperatures and the forecast for even more days of chilling weather to continue. With the forecast for snow this afternoon and possible freezing rain this evening, you can't help but curse that groundhog, even though statistically we know the Groundhog Day theory is not entirely relevant. So, with that in mind, we can pull up the handy dandy app that calculates the number of days til Spring...which happens to be 29 days or approximately one month, just enough time to prepare the garden!! Hang in there - Spring is coming, soon...promise!!! It's a national day of honor and remembrance for the nation and I wanted to shed some light on the actual reason for the celebration. Historically, the actual holiday was to observe the birthday of George Washington and it began just months after his death on December 14, 1799. It wasn't until 1879, that President Rutherford B. Hayes declared Washington's birthday as a legal holiday as an opportunity for our nation to reflect on not just the first president, but also the founder of our nation and the core values of our country. I hope you are able to enjoy this day with rest and reverence for the many presidential leaders that have helped make our country the influential nation which we call the United States of America! Here's some additional information about our nation's history and some of the presidents we honor on this day. What one thing would make your Valentine's Day special? For most of us, it would be that someone cares enough to remember us on the one special day of the year that means love. It's going the extra mile to say that you really love someone when you remember them on Valentine's Day! Make sure to go the extra mile....and have a happy day! The South Grand Lake Lions Club is getting ready for the annual Grand Dam Run which is scheduled for Saturday, April 6th. You can participate by entering to do the fun run, the 5K or the 10K runs. There are also opportunities for businesses and individuals to donate to sponsor the event and have their logo appear on the back of the event t-shirt or to sponsor a runner. All funds raised will help support the Leo Club scholarship program and the Langley Veteran Plaza! To signup for the run or get more details click here: https://runsignup.com/granddam5k10k. To make a donation to support the event, please contact Amber Wigington at (918) 782-7901. This week has been extremely frigid and difficult to bear with temperatures in the low single digits! I'm not alone when I scream, "What the heck, Groundhog"!! I'm trying to be patient and tolerant of the season, but it's sometimes such a challenge when I absolutely love summer and lake season! On a positive note, I'm looking forward to Valentine's Day! The 2019 boat show was a huge success! It was amazing to watch our Arrowhead & Cedar Port team pull together and break the sales numbers from last year by leaps and bounds. It's an indication that the salesmen and the company have a reputation and dedication to providing a quality product and to servicing the customers...before, during and after the sale! Now that we are back in the office, we have many boats to deliver to new homes!! The weather outside is starting to get cold again! Hang in there though....Spring is Coming! The Tulsa Boat, Sport & Travel Show got off to a fantastic start with VIP Night. I saw so many customers and met new faces. This was definitely an important beginning for me as I was able to show our new fleet from Regal. I hope you were able to make it out. If not, please make plans to bring the family and enjoy the spectacular displays and entertainment. Spring is coming and this type of event will for sure get you in the boating spirit! There are seven more days until we kickoff the Tulsa Boat Show. It's been a great learning experience for me and I hope you can make it! There are thousands of hours involved in preparation, setup, and during the exhibit and you won't want to miss out on any of the fun and festivities!! Check out the highlights and show times right here: Tulsa Boat Sport and Travel Show. This will be my first boat show to work as an exhibitor and I'm super excited to have that opportunity. In reviewing some information about the Arrowhead display, I found some interesting facts that I think you will find remarkable. For instance, the Arrowhead exhibit will be 20,000 square feet of space. There will be 42 brand new boats ranging from cruisers, runabouts, pontoons, surf boats, and inboard ski boats. If lined up nose to tail that is 1,100 linear feet of new boats, which is 100 feet short of four city blocks long, with a value of $7,000,000.00! This includes a hospitality lounge and restaurant for our members and their guest on a balcony overlooking the entire show. This makes the Arrowhead Tulsa Boat Show exhibit the largest square footage display, with the most new boats of ANY boat show in the entire United States...coast to coast, border to border!! Needless to say, I'm grateful to work for such an amazing company and to be a part of this team as we roll out the latest and greatest water vessels in our area. Hope to see each of you there!! It's been super busy at our Arrowhead, Cherokee & Cedar Port locations as we prepare boats and transport them to Tulsa for set up and display. The crews in charge of building the exhibit will be hard at work next week. This year we will have a live web cam so you can watch the entire process of construction from start to finish. Tune in to watch on Tuesday, January 22nd by going to the website at: https://www.arrowheadok.com/videos. When cleaning your boat it's important to use products that don't create adverse affects on the water quality, marine life, and even to yourself! GRDA recommends phosphate-free and biodegradable cleaners that will give your boat or other water vessel the best sparkle, but won't harm the ecosystem. Check out these awesome cleaners, available at the marina, that help make the cleaning job easier and also protect the preciousness of our beautiful lake! It's was a beautiful sunny Saturday here on South Grand Lake! Don't forget the marina is open. The coming week looks promising for more sunshine. Hope you have a chance to get out and enjoy it! Hope that was enough to give you some inspiration to get started on your music playlist or to update an already current one. It's never too early to get ready for that warmer weather and the opportunity to enjoy LAKE LIFE!! It's once again the time of year when we count our blessings and all that we are thankful for and maybe we make a resolution to improve or implement something for the upcoming year. Each of us have an opinion on whether we wish to vocalize or convey that intention in writing or merely internally make a commitment. Not everyone, but most of us like to establish a goal for the next year so that we know how to navigate the sail or adjust the paddle. If you haven't thought about it, you still have some time! See you in 2019! Have a safe and happy evening! There are several reasons you might want to consider attending the 2019 Tulsa Boat Sport and Travel Show. One reason might be to see the newest models on the market and to look at the most innovative trends in boating accessories. Other reasons might be to reconnect with your boating friends and family or to catch up with your favorite boat dealer, Jerry Cookson. Whatever the reason, be sure to make plans and attend this fantastic event that will showcase the most amazing water vessels and boating related fun imaginable. 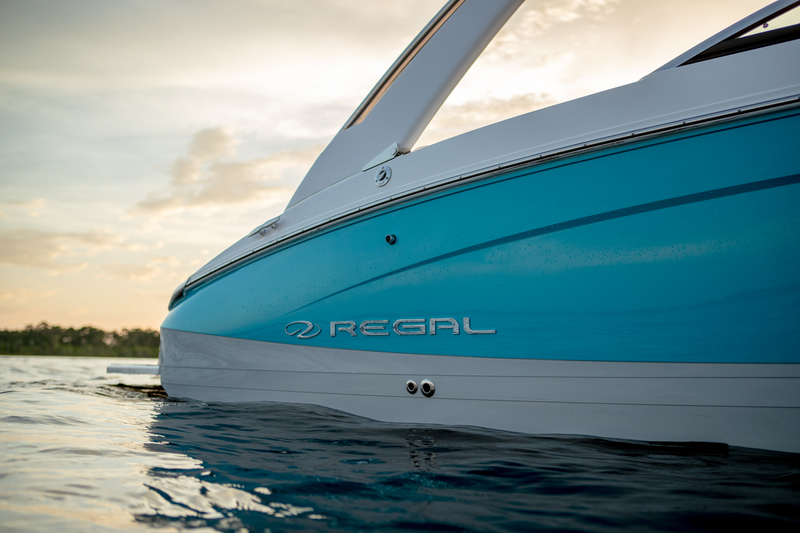 This year you won't be disappointed as we feature the 2019 Regal LS6 and the quality features that are only available with a Regal boat. Don't forget the incredible savings that will be offered on a beautiful new boat that allows you the ability to relax and entertain your loved ones and friends in comfort and style. Mark your calendars for January 28 - February 3, 2019. There are few things about Grand Lake that never get old. It's safe to say that watching a sunset will never get boring, mundane or tiresome. In fact, it can be the highlight of the evening. I love the inspiring posts on Facebook and the hundreds of friends who always find time to hurry outside to grab a snapshot of the perfect moment. If you haven't experienced the opportunity to observe the sun setting on beautiful Grand Lake o' the Cherokees, you need to find out what you're missin'! The hustle and bustle of Christmas is over and...it's cold and rainy. I sit here wondering how the days of this season will ever hurry fast enough to avoid my usual disgruntled mental condition with the nasty effects of "OLD MAN WINTER". I, along with so many, cannot wait until spring and summer because we love the opportunity to get back on the lake with swimsuits and floating mats. January can be the longest of the twelve months. After some careful thought, I would offer these few words for anyone who has a hard time battling the winter blues and needs to find peace with the present chilly time of year. Once a year the organization called South Grand Lakers Helping Children and Arrowhead Yacht Club come together to sponsor the Polar Bear Plunge and this year I was able to participate and experience the amazing unity that comes with working together for a worthwhile cause. The plunge wasn't as horrible as I thought it might be. It was actually so much fun and I can't wait to do it next year. Of course, being the lake rat that I am it was a great opportunity for me to get back in the water....even if it was only 55 degrees! That's pretty incredible for a girl who won't get in past her waist until about July!! :) If you've never done this, I highly recommend you give it a try next year and find out why we don't mind "Freezin for a Reason"! Who doesn't love a parade? There is nothing more perfect to get a person into the holiday spirit than the experience of the illuminated boat parade. The participants sure know how to do it right and Cherokee Yacht Club puts on the best show around. It starts dockside at 4:00 pm tomorrow with the captain and crew meet and greet. The parade then begins at 5:30 pm with boats making the glorious trip down to the dam and then back to Cherokee Yacht Club for awards and more festive holiday spirits and entertainment. Make plans to join us around the pond to watch this beautiful display of talent and creativity which cannot truly be replicated in photograph or video. Don't miss out on the meet and greet with Santa at Disney City Hall starting at 3:00pm. Also, hang around for the the land parade that is still scheduled and will begin at 6:00 pm and ends with fireworks!! In an effort to protect the public safety, the Arrowhead Yacht Club Polar Bear Plunge and the Cherokee Yacht Club boat parade were cancelled for tomorrow night. It's now looking like the critical weather may not strike and the rescheduling may be more of a nuisance than most prefer to admit. It's time to look at the bright side of the matter! There are no risks of endangerment in the event something disastrous would occur as most recently was the case in Missouri when the duck crew departed despite the possible storm warnings. Also, everyone can enjoy the Disney/Langley land parade that goes across the dam without fear of missing the ever popular boat parade, which was the case for me last year! There are still a lot of holiday activities on the agenda that can be enjoyed this weekend in south Grand Lake and in the surrounding communities so get out and enjoy them! I hope you're getting into the holiday spirit. Each day it gets closer to Christmas, I'm reminded of the cute little song by Mariah Carey and it's hard not to sing. It's such a sweet rendition of that one item, thing or person you want in your life so much that nothing else matters. It's pretty remarkable that I feel the same way as M.C., in her precious melody. I don't care about the presents underneath the Christmas tree. I don't need to hang my stocking on the fireplace that night. I won't ask for much, I really don't ask for snow. I'll just keep on waiting underneath the mistletoe. All the lights are shining, so brightly everywhere. The sound of children's laughter fills the air. Everyone is singing, I hear those sleigh bells ringing and one last time I plea....Santa bring me that one thing that I really need...All I want for Christmas is...to be on a boat!! This weekend will be full of fun events, friends, family, and festive things to do. One of the events on Saturday will be the Polar Bear Plunge. This charity is supported by Arrowhead Yacht Club and South Grand Lakers Helping Children by assisting those in need with food, clothing and toys during Christmas. Your donations and participation also help the group to provide financial assistance to families in need throughout the year. This year the weather prediction is going to be pretty frigid thereby giving anyone who braves the cold and makes the jump into Grand Lake o' the Cherokees the satisfaction of Freezin' for a Reason! Make plans to be at Arrowhead Yacht Club on Saturday to support the 2018 Polar Bear Plunge! This is your Christmas! But, exactly what does that mean? It is more than a celebratory holiday. It is more than a time to give gifts and to be giving for a few days out of the year. It is more than a remembrance of family and friends. However, it may include all of these things, the substantive meaning of Christmas is greater and I encourage that you let it be greater for you. Let it be a time that you find a greater purpose in the world and that you accept and experience the desire to contribute to others on a different and deeper level, not just during the month of December, but for the entire year. Make a commitment to daily give back to the community and to seek out opportunities to assist in ways that create meaningful moments in the lives of others! Today, as I was planting some pansies and kale around the marina, I thought to myself that flowers and boats are a lot alike. I mean, we all like to enjoy the beauty and splash of color that flowers can provide, as well as the warmth and vitality they bring to the flower bed. This feeling is no different during the winter. And how many times do you wish that you could continue the boating fun all year? For me, I have that desire every day! It's amazing to me how many Grand Lake Boaters do not winterize their boats, which enables them to utilize their watercraft all year long. Keeping your boat in the water during the winter is possible it just means docking at a marina that provides protection from water freezing around your boat and will continue basic services for slip renters in the off season. Cedar Port Marina is open and staffed all year to provide the assistance to our customers and especially our slip renters to allow them the ability to enjoy the amazing lake life and year-round boating, as well as to enjoy the beauty of flowers! Looking for a great Christmas parade? There are several to choose from so just look around and you'll find something to please everyone. If you're in the vicinity of Pensacola Dam then you'll be pleased to know the activities encompass more than just the parade. Starting at 3:00pm on December 8th, there will be games, a petting zoo, bounce house, hot chocolate, coffee, food and cookies, and a visit from Santa!!! Following the land parade, there will be fireworks and awards for parade entries. It takes participation from many people to help make the events around South Grand Lake a memorable time. I hope that everyone in the community and many others are able to get out and enjoy the beauty and love that surrounds life on the lake! Yesterday the skies were dark and the winds were blowing like madness. When looking out across the lake the waves resembled that like the massive tides rolling in from the ocean. We all stayed hunkered down in our warm homes and decorated for the most joyous holiday of all...Christmas, which means getting buckled in for winter! Today, we wake to the sun shining and hoping for another beautiful opportunity to get back out on the lake! Yes, of course we will get back on the lake again before next summer. Are you kidding? We're lake rats and if you're livin' the lake life you're never gonna miss an opportunity to let your sun shine on the water! Since the beginning of the Fall season it seems like everywhere you turn, there's a chili cook-off for charity fund raising, company and team camaraderie, or just good fun entertainment. But, who doesn't enjoy an awesome bowl of belly pleasing chili when it's blustery cold outside? Last weekend, Arrowhead Yacht Club sponsored a company-wide chili cook-off and the heat was on with Arrowhead Boat Sales trying to defend their award winning status from last year. Despite the pressure to compete with our fellow Arrowhead co-workers, which included yacht club dining and VIP Pizza staff, you can imagine the excitement when Cedar Port Marina was victorious and named the new Champions with Knockout Chili! If you didn't have a chance to make this event, there are still plenty of other events coming your way and I encourage you to get out find your own favorite cold weather remedy! I love sunsets! I love the way the sky lights up with brilliant red and orange hues across the horizon! No matter how many sunsets I see, they are all amazing! It is true, sunsets are proof that even when you have a bad day, it can still end beautifully! It's been a crazy cold week, with a scramble to get all the boats winterized and ready to survive Old Man Winter. Are you ready? The week is ending with warmer temperatures, sunnier skies and fun-packed entertainment to make the days on Grand Lake exceptional and newsworthy! The upcoming thanksgiving feasts, holiday land and lake parades, football playoffs, ugly sweater contests, Christmas gift exchanges with family and friends, New Year's celebrations and then the beloved boat show. If you just want to relax and enjoy life then you've come to the right place. If you just want to connect with positive people during events that promote amazing friendships and meaningful adventures, then simply look around! Your grand life at Grand Lake is happening now. Don't get caught being a Peeky Blinder - get out of the house and have a Grand day! We're getting our first snow of the Fall season. The weather has changed up so fast and now it feels like winter. I want to be sad and upset when I look out and see all the white coming down around me and when I feel the bitter wind blowing across my bare hands. I'm not ready for this, I say to myself, reminiscing of my summertime lake fun! Then..........I looked at another side of the picture. Do you see it? Every snowflake is different and unique. They come in many shapes and sizes, but are perfect and silently peaceful in their own way! I'm still not ready for winter. I love summer and my time on the lake, but today just let me be a snowflake! It's Saturday morning! I wake up, grab a delicious cup of coffee flavored with toasted pecan and french vanilla, stare out the window and contemplate the day's activities. Some might think there is nothing to do during the colder weather, but they are mistaken. The options are numerous and sometimes the decision-making is overwhelming. Anything wrong with this picture? Absolutely not! Grand Lake living is incredible, especially when there are so many amazing friends and family to share in the fun. This afternoon I'll be watching the Bedlam game (OSU v. OU) from a perfect little place that has an awesome lakefront views! Where might that be, you ask? That can be just about anywhere as you walk the 460 miles of shoreline and discover your own adventure! My best wishes to you all for a Grand Day! It's amazing that twenty-nine years after the first boat parade made it's debut, we still look forward to the winter festival of water vessels and all the beautiful lights. This year the activities take on an additional twist by adding a dock decorating contest in Duck Creek. Winners of that contest will be judged and announced in conjunction with the completion of the boat parade. My favorite holiday of the year and it includes boats! Have a Grand Day! In one month, it will be that time of the year when groups start forming to support a wonderful charity event to raise money for needy children and families throughout the Grand Lake area. The 2018 Polar Bear Plunge is plugged as Freezin for a Reason! I'm shivering just thinking about the idea of jumping into the lake in December. So, would you believe that I'm also super excited for the opportunity to support this worthwhile cause to dress up with a group of ladies that I consider friends and lunge myself into the bitter cold waters that are usually too frigid for me until the month of July? I've been told it's ok because the coffee and Bailey's will keep me warm. Join us at Arrowhead Yacht Club and support Freezin for a Reason! Today I'm here to announce the newest addition to the Regal fleet and it's coming soon! With Regal being one of the top best luxury yachts in the industry, the new 38 Grand Coupe will be a beautiful option for superb style and upscale amenities on Grand Lake. We feel that Regal has truly raised the bar again with a new standard in more luxury, more storage, more comfort, and more technology. Let's Go Boating!!! As the month of November kicks off a time when we associate Thanksgiving with the opportunity to be thankful, I'm reminded of so many people and things for which I'm blessed. I think that if we're lucky enough to enjoy life, we definitely should be able to find a multitude of reasons to feel grateful and to celebrate. Among the top things on my list are enjoying beautiful sunsets on the lake with family and friends. How about you? If you haven't had a chance to stop long enough to think about your blessings, I challenge you to take a moment out of your day and just look at your own harvest! Let's all have an attitude of gratitude!! Have a Grand Day! Even though the air is much cooler and the wind is brisk, the fishing is still the best around. There were many fishing boats out this morning working the waters. It's crazy to think about the necessary equipment those guys and gals need to stay warm as they rush up and down the lake to desired hot spots. It's awesome that Oklahoma has some of the best fishing around and is viewed a favorite lake by some of the most notable professional fishermen, as well as host a multitude of fishing tournaments. Make sure to mark your calendars for the 2019 Bass Pro Shops Bassmaster Central Open Series that is scheduled for September 12-14, right here on beautiful Grand Lake! There's another reason why the lake life is the life for me and so very many others! In making my way to work this morning I encountered a problem with our beloved Pensacola Dam being closed, which put a halt to my plans and agenda for the morning. As I sat in my vehicle complaining to myself about the frustrating inconvenience it forced me to stop my rushing and remember the historical landmark that was painfully and diligently constructed so many years ago. Grand Lake is the beautiful result of the need to provide power to it's surrounding communities. As many of us enjoy a multitude of activities and lifestyles because of the dam we should consider ourselves blessed to be lake bums and appreciate the progress that's being made as the Grand River Dam Authority (GRDA). When I first heard the mention of "Fall Ball" on Grand Lake I wasn't really sure what that meant. I envisioned a fancy party with lovely gowns and tuxedos. I even searched for the date of the possible event thinking how awesome it would be to join the fun. I'm laughing now as I have figured it out. Each wonderful sunrise and sunset brings the majesty of beautiful fall colors, changing leaves and quiet waters. It's the opportunity for boaters to enjoy the cooler temperatures and a lake cruise to their favorite restaurant or pub wearing sweaters and closed toe shoes!!! We had an amazing weekend with opportunities on both Saturday and Sunday to get out on the water and soak up the sunshine and cooler weather! It was nice to see so many of you stopping by to say hello, grab some fuel and add that fuel stabilizer. During the winter, boats often sit unused for an extended length of time. If a boat is not properly winterized, moisture will be trapped in the interior components of the engine, which will cause corrosion. This makes winterization a crucial procedure in order to protect your boat motor during the off season. Proper winterization includes professional anti-corrosion techniques and can be performed by our trained and certified maintenance technicians. In order to schedule your winterization, give our Arrowhead Service Department a call at (918) 782-4477. It's a beautiful fall morning on Grand Lake! I love the cooler temperatures, autumn sunshine and boating, of course!! Even though the summer months have slipped past, we are still busy and we are still working at Cedar Port Marina to meet all your boating needs! The ship store still has a few remaining pair of the OluKai footwear, which is an awesome Hawaiian brand that is created with quality materials and your comfort in mind. I can help you find the perfect pair for any of your casual or dress-up activities! Last night's party was simply the best way to end summer and say thank you to all the customers who help make Cedar Port Marina a success! The weather was perfect. The food was delicious and the entertainment by Mike Barham was amazing as always! Everyone from the youngest child to the most mature adult had a smile on their face and a satisfied tummy! There's just nothing like being on the water with a peaceful bonfire to help you forget the worries and stress of the world. Most importantly, it's the perfect opportunity to relax and spend time with each other and do nothing but simply enjoy life!! This is Lori at Cedar Port Marina! It's been a crazy-busy summer with boat sales, boat sales, and more boat sales!! The bustle of summer really zoomed past me! My recent experiences with living on the lake and working on the water taught me that it's always a good day and there's always a reason to smile!! Lake life provides multiple opportunities to make memories with loved ones! One of my favorite memories includes watching fireworks burst overhead with the reflection of hundreds of boats gathered together on the lake to celebrate our freedom. I hope you had a chance to enjoy epic water sports, watch beautiful sunsets and sunrises, meet new friends, dine at your favorite lakeside stop and to simply relax! When you’re considering investing in a boat, it doesn’t take long to realize just how many different options there are. You’ll want to think about what you plan to primarily use your boat for so you can narrow down your choices. 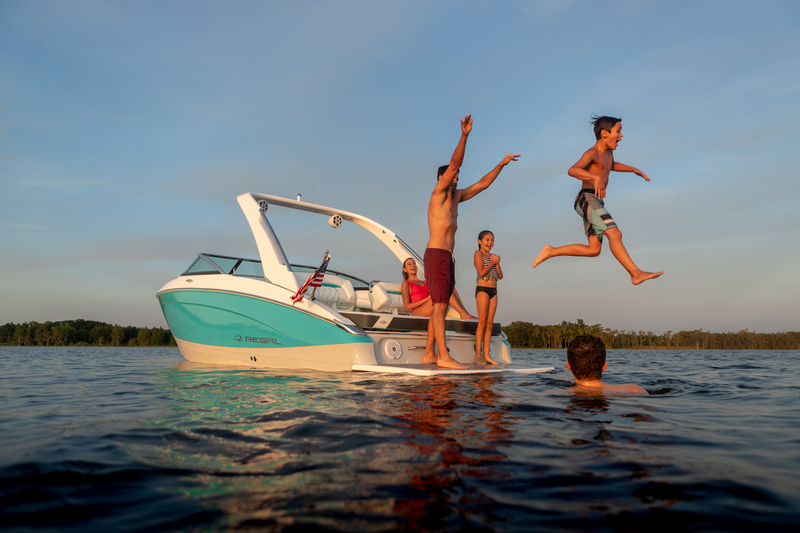 If you’re interested in a boat that has room for you and all your friends to spend the day on the water, you might find bowrider boats to be a great option. Bowrider boats are compact, affordable, and ideal for group outings when you want to have some fun in the sun with your pals. Cedar Port Marina can help you find the perfect bowrider boat. Give us a call or visit us today! Simply put, a bowrider is a style of runabout boat that offers extra seating at the bow near the front of the helm. This additional space allows you to take a large group of friends out on the water with you for a relaxing day in the sun. Bowriders are mostly leisure crafts so they’re not well-suited for fishing as they lack many of the amenities large boats tend to offer. They also don’t have a cabin or a roof as they consist of a single deck. They’re mainly intended for use on days where the weather is nice and you just want to do some pleasure cruising. Bowrider engines are either a stern drive or an outboard. Some bowrider engines are designed for use in casual cruising. Boats that are less than 21’ have a more simple design and don’t have massive storage capacity like larger boats often do. You’ll have the best experience on a bowrider when boating in small, calm lakes. If you choose a larger sized bowrider then you’ll have more options, like a large U-shaped seating area and additional storage options. A larger bowrider also gives you the ability to tackle more vigorous waters. Some bowrider boats even feature loungers at the stern for the ultimate relaxation experience on the water. As mentioned, bowriders are best suited for use in inland waterways like calm lakes and rivers instead of the open ocean. Due to their smaller size and the fact that they’re no longer than 35’, bowriders are not well-equipped for taking on rough sea conditions. They still can have powerful engines that let you reach top speeds for fun, spray-filled rides across the water. For this reason, bowriders are great for water skiing. The best use for a bowrider is as a pleasure craft for enjoying sunny, easy cruising and relaxation on the water. The ample seating options allow you to take as many as ten passengers aboard! There’s plenty of room for sunbathing and swimming preparation. Bowriders are an excellent choice for those seeking a recreational boat that provides pure enjoyment on the water. The Regal Bowrider Series is a great option with a classic look full of many awesome features. For starters, there’s the Fastrac hull design with a full-beam step and an aerated bottom that provide reduced friction. The boat is also able to glide freely through the water at faster speeds and with improved fuel efficiency. The PowerTower can be either raised or lowered with a simple touch of a button. This feature is highly functional and makes navigating a breeze. The immense storage space is second to none and properly equips you and your passengers for a day of fun with room for all the essentials and more. The super convenient full-beam platform is position at the waterline for seamless boarding. With bow seating, social seating, and arena seating, none of your passengers will be scrambling for a place to sit. 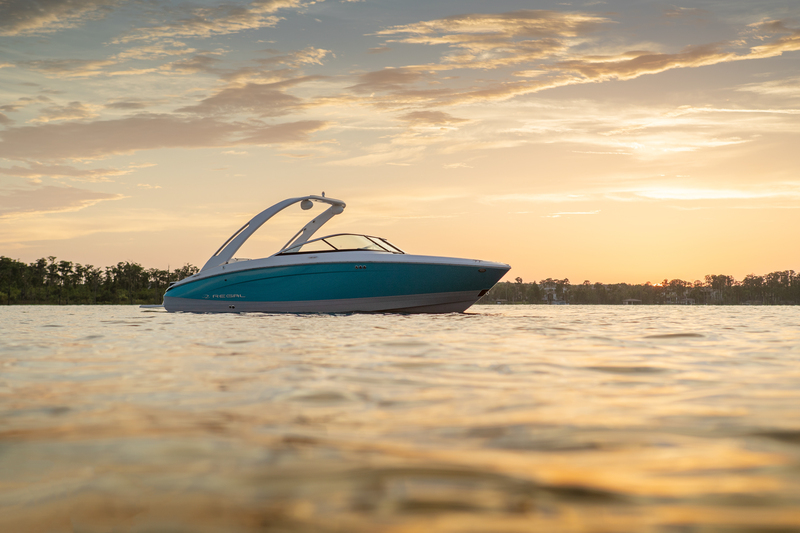 We can’t wait to help you find the bowrider boat of your dreams! Stop by Cedar Port Marina to start browsing today!